Your fee supports the compassion education work of DGCEC! 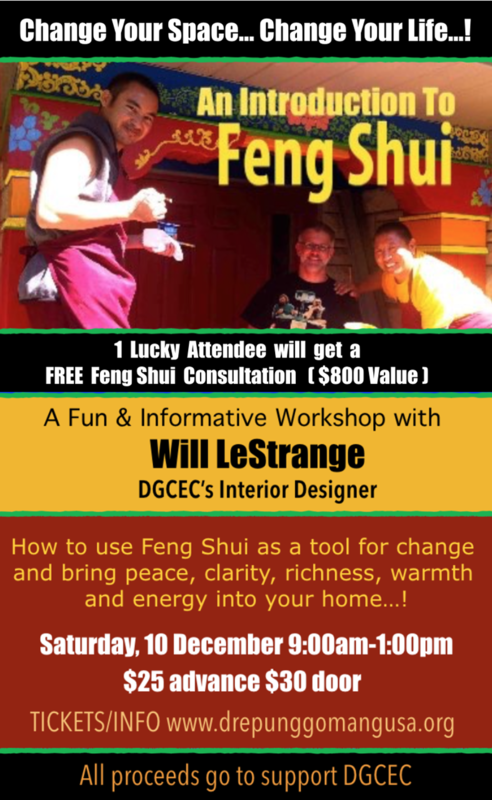 Join Will LeStrange for a fun and interactive Feng Shui experience. Bring your floor plans, your curious mind and prepare to see your home with a new awareness. No previous experience is necessary. Your surroundings effect the way you think, feel, and behave. Your home is a mirror of you, your inner life, and your values. If you wish to change some part of your life, then it makes sense to support that process by changing your environment too! Feng Shui, the ancient practice of living in harmonious alignment with the environment, can be a very helpful tool for living a more mindful life. Scratch the surface and you will discover a rich tradition that offers far more than simply moving your furniture. Feng Shui is a “Life Design” tool. If you have visited the Drepung Gomang Center for Engaging Compassion, you will have experienced the joyous, tranquil setting of the shrine room and the vibrant, affectionate presence of the Compassion Education Center. This is Feng Shui in action! A perfect case study. So come along, bring a friend or partner and prepare to meet 2017 with a fresh new outlook. After 20-years of professional Feng Shui consulting and Buddhist meditation practice, Will LeStrange has developed a unique perspective for understanding the relationship between your inner and outer landscape. $25 online registration; $30 at the door. All proceeds benefit DGCEC.